Porcelain Veneers are like a false fingernail and are bonded to the front surface of the tooth allowing for changes in tooth colour, size and shape. 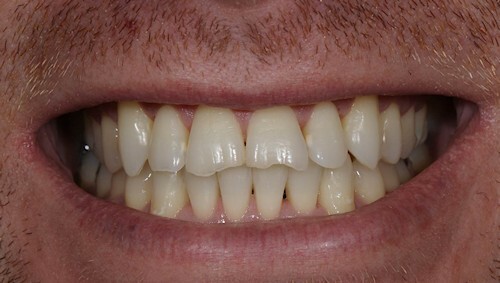 Porcelain veneers work best when bonded to tooth enamel. 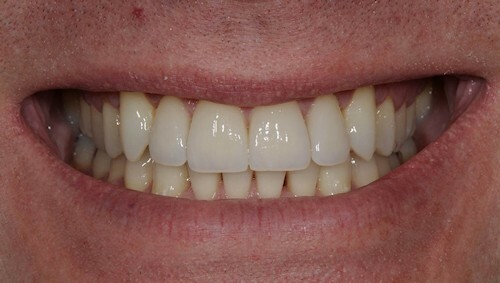 When there is little enamel remaining due to significant wear, erosion or large fillings in a tooth, or where major changes in shape or colour are required, a bonded all-porcelain crown may be a better option. Having completed orthodontic treatment to straighten his teeth, Michael wanted to refresh his worn upper incisors with porcelain veneers.